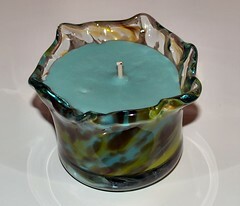 So I decided to make a candle out of one of the things I made in my last trip to the Glassblowing Studio. Ain't it perdy? I'm not sure when our next trip to the studio will be. It's just a hassle going all the way to Seattle to do it and then having to go back again to pick up the stuff we made. We did find that there is a studio right in Bothell, where Doug lives. We checked it out over the weekend. It's much smaller than the place in Seattle but I don't think that matters. They had fliers about with various classes they were doing but I'm not sure if they rent out the studio to people or not. That is something that we are looking for. We pretty much have down all the basics it's just practice that we need now and it would be nice to be able to do it some place closer. Oh and in case you're wondering. This is a green tea scented candle. It's actually pretty yummy.